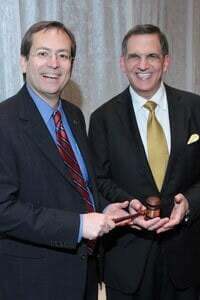 As the newly installed President of the Harris County Medical Society, Facial Plastic Surgeon, Dr. Russell Kridel delivered a noteworthy inaugural speech at the 2013 HCMS/HAM Installation of Officers & Leadership Recognition Dinner on January 18, 2013 at the Petroleum Club in downtown Houston. 2013 HCMS President, Dr. Russell Kridel accepts the gavel from outgoing President, Dr. Keith Bourgeois. Here is an excerpt from Dr. Kridel's inaugural speech: ..."The absolute commitment to patients is what defines physicians and separates them from other professions. Patients put their lives in our hands; how scary it is for them to have a disease process change the course of their lives. That sacred trust they place in us comes with great responsibility, to provide the best care possible and be patient advocates without any other motivation"... The full transcript of the speech can be found at Dr. Kridel's blog ---kridelonhealth.com --- on current health care issues that are important to both physicians and patients.